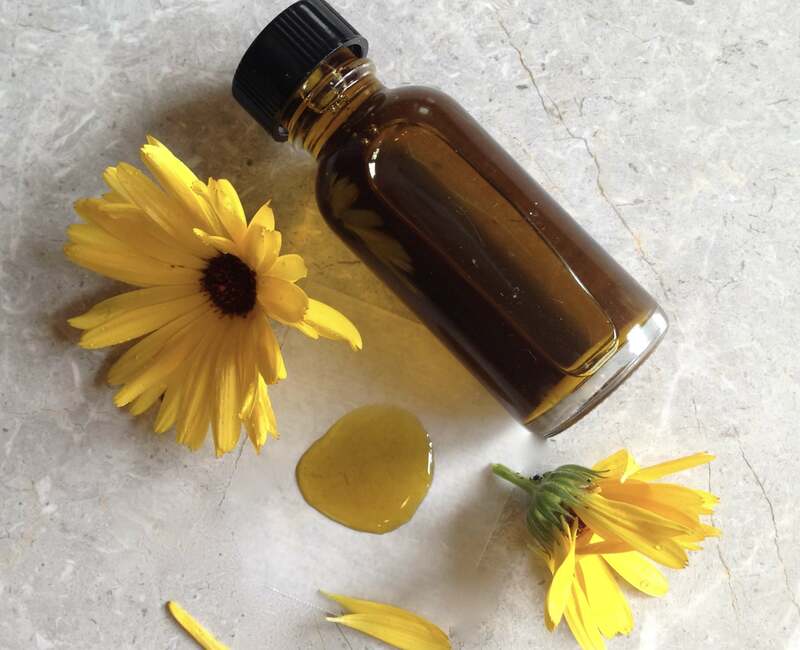 Calendula, the darling of the skincare and herbal worlds is usually processed as a macerate of the flowers into a carrier oil like olive or almond. 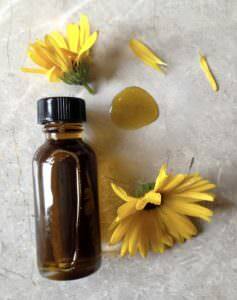 Only recently has the possibility of a carrier oil pressed from the seeds of calendula become available. As an oil geek, this is very exciting! In a manner similar to pomegranate seed oil calendula fixed oil has its own named fatty acid, Calendic acid and is composed of at least half of this named fatty acid. An omega 6 fatty acid, calendic acid bears a strong similarity to punic acid found in pomegranates. Both fatty acids are conjugated and known for their ability to help the body repair itself and maintain health. Naturally formed trans fatty acids are often conjugated and are different from most fatty acids found in plant oils in that the carbon chains are twisted due to the placement of the double bonds. At least 50% of the pressed fixed oil from calendula seeds is calendic acid while pomegranate seed oil is 70% punic acid. Conjugated fatty acids are under intense study for their ability to heal and maintain health. Now that I’ve received a sample of the oil, I’ve compared and contrasted it with other oils especially pomegranate with its similarly formed conjugated punic acid. The feel is lighter than pomegranate, as the calendic acid (conjugated) is a lower percentage 50%, than the 70+% punic acid in pomegranate. It is this conjugated form that gives the oil a thick and heavy feel. The sample I have is very yellow, reminiscent of the resinous yellow and orange flowers, a nod to a healthy unsaponifiable portion. The oil feels protective as the balance of the fatty acids are ones that do not penetrate the skin readily. A thin layer spread over the skin will nourish and protect it from the environment and keep moisture in the cells. Calendic acid is a CLnA trans fatty acid named for the Calendula plant, often called marigold. At least 50% of the pressed fixed oil from calendula seeds is calendic acid with it’s full profile below. Note: I hope to fill out this profile in time finding better references to the trace amounts of the lesser fatty acids.